Yup! It's time to celebrate The Craft's Meow's birthday and I can't think of a more perfect way than to give you a sneaky peek of two gorgeous new sets by Nina B Designs to be released March 21st; the chance for you to play along with us, and the opportunity to grab one of these gorgeous sets for yourself! Liking the sneak peeks today? Well why not leave a comment on The Craft's Meow Blog? Doing so could bag you one of these gorgeous sets for your own inky mitts! So d'ya fancy joining us for the party? Then why not play along with the same sketch and share the inspiration? You need to use TCM goodies to enter. Don't have any TCM goodies? No problemo: if you like TCM on Facebook then you'll recieve two free digis courtesy of new TCM designer: Karen Baker! Not on FB? No worries! Pop TCM an email (thecraftsmeow@gmail.com) and you'll get the digis that way so there's no excuses to not party with us! 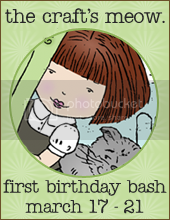 Full deets of our party can be found on The Craft's Meow Blog. You are here! 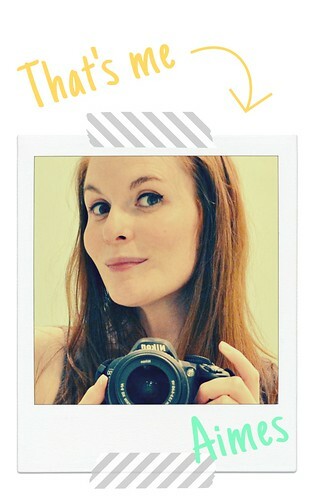 ---> Amy Wanford <--- You are here! Thanks so much for stopping by today! 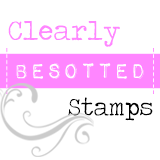 Be sure to check back tomorrow for another sneaky peek of a fabulous stamp set to be released on March 20th! Fantastic cards! I love the velum rose. The simple card for dad is wonderful as well. What a lovely card, Aimes. I just know your mum will love it. Awesome presence! I love the white on white-very elegant. Theae are AO great! Live your cAS style! The first one is just so stunning and elegant, love the embossing on vellum, and the second is so simple and guy perfect. Love that you used eyelets! Really love how you rocked the sketch!!!!! WOW! Your mother's day card is stunning. 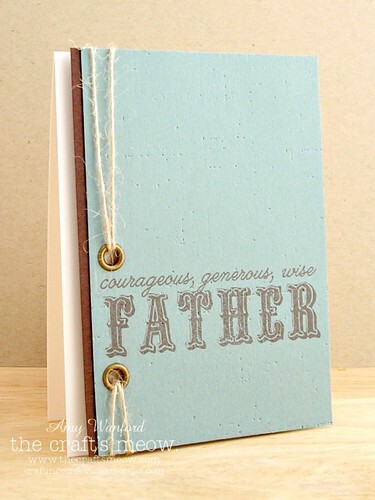 Love your Father's day card too...very masculine, very cool! I love both of your cards! The white is simply gorgeous. congrats on making the DT! Love that fab Fathers' Day card!!!! Jaw drapping...the first one...is so elegant...and of course the second one is AWESOME. What a way to showcase a beautiful feminine and a fab masculine card. Fabulous cards. I like the embossing on vellum. aw, Diva, thanks for the birthday shout out!! I hope you'll enjoy that beer you HAVE to drink to celebrate!! LOL The first card is just stunning!! That flower looks so delicate :) What a lucky mum :) And you are bringin' the eyelets back!! We'll note that you are starting the new trend :) It's like the keep replenishing in the jar!! LOL Fabulous start to your new DT, Duchess :) Hugs and Happy Green Day!! Both cards are simply fabulous, love the white on white and your beautiful colors and design on your Father's card! real shows off that pretty flower. I LOVE the delicate look of the embossed flower card, Aimes! It would make a great wedding card, too. So lovely! And the eyelets ROCK on your man card. Totally awesome! I wish I could lift a pint with you in person, but I'll do that from here in spirit. Maybe mine will be a glass of wine, though. Beautiful - both of them - perfect contrast of masculine and feminine cards! Totally love your CAS card Aimes! That vellum flower is stellar! So happy your are on the team! both cards are gorgeous. Love the vellum flower for mother's day card and masculine card for father. Both card are awesome! TFS! 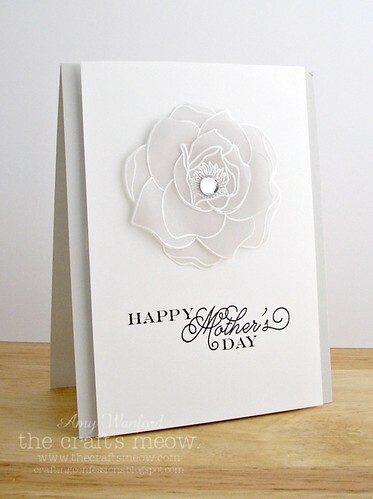 Wow -- love the vellum flower on your beautiful Mother's Day card. The script is gorgeous too. Your Father's Day card is super CAS! Both of your cards are awesome Amies, but your Mother's Day card is over the top awesome! Perfect in every way! Aimes, it is always a delight to come to your blog and see what you have created. Love your Mother's Day card with the clean lines. Still looks very elegant to me. An excellent masculine card too! Girl...you do CAS to perfection!!! Love the flower embossed on vellum and the twine "up the side" is perfect!! Just LOVE your first card. The white on white looks stunning. And your Fathers Day card is very masculine looking. Totally love both of these cards Aimes! Complete contrast with the two different colour moods. I *adore* that vellum flower but equally am going giddy over that Father's Day card!! Congrats on your big news - I just new it'd be a DT thing, was just waiting to find out who the lucky company was!! You're becoming a real star flying the UK flag for us crafty girls!! You've knocked it out of the park Aimes, on both your cards! I love that flower on vellum! Your work is always so beautiful. Both of these cards are great. Any mother or father would enjoy getting them. The vellum flower is an extra special touch. Nice, as always! Gorgeous, gorgeous, gorgeous. CAS. Gorgeous. Had to come check out that vellum rose after seeing the thumbnail at TCM. Did I mention I find it gorgeous? Hi - pretty much just stumbled onto your blog, and just had to stop and tell you your designs and style are so classy and elegant! Love it!